Ships from and sold by Save More On Pool Supplies in easy-to-open packaging. 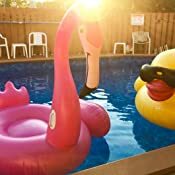 EASY TO INFLATE: GAME’s Giant Derby Duck is an iconic giant blow-up duck, perfectly designed for a day at the pool, the river, or other aquatic fun. It’s been designed with multiple quick-fill valves, which makes it easy to inflate and deflate. 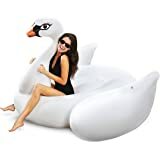 HOLDS UP TO 300 POUNDS: We’ve designed this big inflatable duck with precise manufacturing standards and high-quality materials. It has a weight capacity of up to 300 pounds and can hold multiple children or adults. 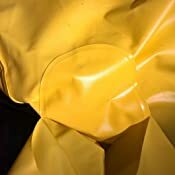 DURABLE VINYL MATERIAL: To ensure longevity and durability, GAME uses high-quality 0.03 mm vinyl in the construction of our Giant Derby Duck. The material expands yet folds easily for simple and convenient storage. BUILT-IN CUP HOLDERS: Everybody loves a refreshing beverage while they’re floating at a pool party, the river, or other special event. To make this easy, we’ve included two built-in cup holders to be used while in lounger mode. 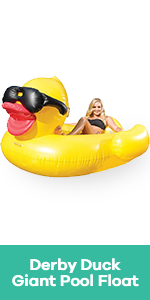 5 HANDLES: Climbing onboard this giant duck pool float is made easier thanks to the 5 handles infused on the sides. You can tie a rope through them, making it easy to connect with other floats, pull them around, and tie them on to a dock. 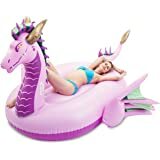 Ships from and sold by Save More On Pool Supplies. 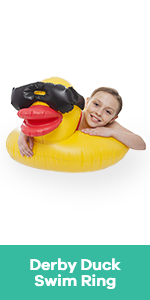 Game’s Giant Derby Duck is perfectly designed for a day at the pool, the river, or other aquatic fun. Designed with multiple quick-fill valves, it's easy to inflate and deflate. 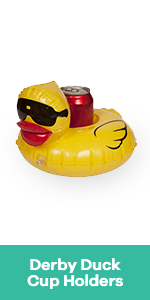 Everybody loves a refreshing beverage while they’re floating at a pool party, at the river, or other special events. For convenience, we’ve designed Derby with two built-in cup holders to use while in lounger mode. To ensure longevity and durability, Game uses high quality 0.3mm vinyl in the construction of our Giant Derby Duck. 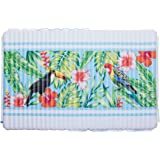 The material expands yet folds easily for simple and convenient storage. 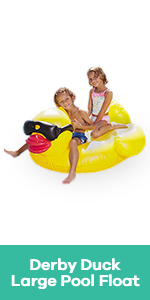 This inflatable duck has a weight capacity of up to 300 pounds and can hold multiple children or adults. 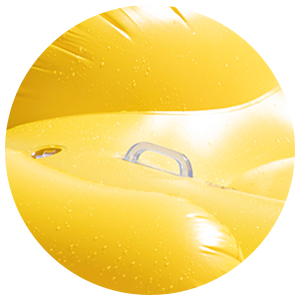 Climbing onboard this giant duck pool float is made easier – thanks to the five handles infused on the sides. You can tie rope through them, making it easy to connect with other floats, pull, and tie on a dock. 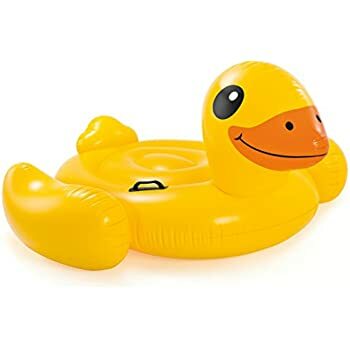 9.5" x 7.5" x 6" 35" x 28" x 17" 48" x 44" x 27" 81" x 76" x 44" 81" x 76" x 44"
Designed from high-quality materials and assembled with precise manufacturing standards, the GAME Giant Derby Duck is that perfect fun-loving oversized inflatable that is exceptional for a day at the lake, pool parties, beach vacations, and more. 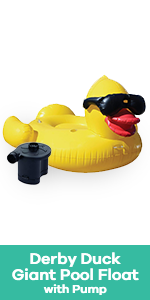 While there are several imitators on the market, this is the original Derby Duck, featuring the patented sunglass-wearing duck that is the star anywhere it floats. 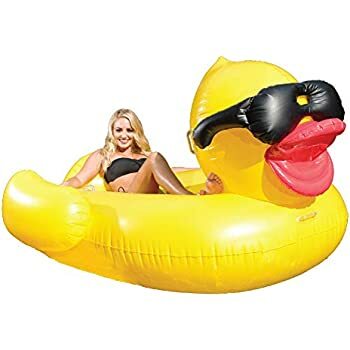 With its easy-to-inflate technology, 300-pound weight capacity, and multiple handy features, this ducky float is both stylish and functional. 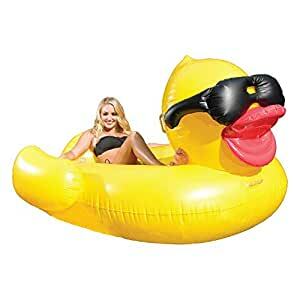 GAME’s Giant Derby Duck is the perfect option for fun in the sun and splish-splash entertainment. 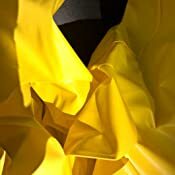 It’s been designed from high-quality durable 0.03 mm vinyl materials and assembled with careful manufacturing standards to ensure longevity and extend its lifespan. 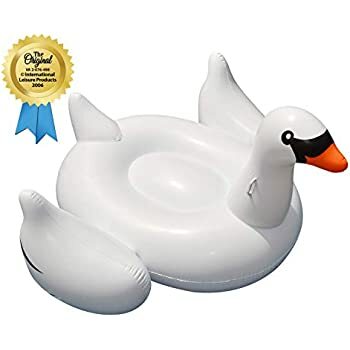 Our attention to detail and quality permits this inflatable duckie to hold multiple kids or adults while boasting an impressive 300-pound weight capacity. 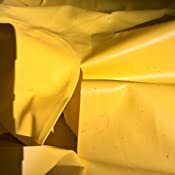 While the material is incredibly strong, it’s easy to fold and store as well. 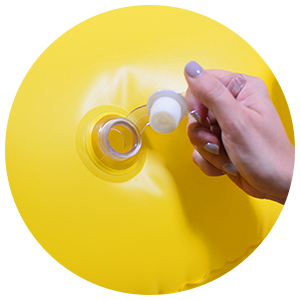 It has also been designed with multiple quick-fill valves, making it easy to inflate and deflate. For those days on the water, we’ve added 5 handles that are easy to grasp and use. 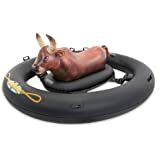 These convenient cup holders have also been designed to permit users to secure rope to them, which makes connecting with other floats, pulling them to and from the water, and tying on to a dock a snap. 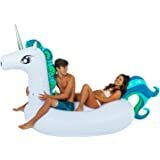 Additionally, this giant inflatable has two built-in cup holders, allowing you to keep your favorite cool beverage close to you while floating in comfort and style. The Giant Derby Duck is an iconic product made by Great American Merchandise and Events (GAME). GAME is a cutting-edge innovator in the special event marketing and merchandising industries. Along with manufacturing and designing high-quality products, GAME also provides services to diverse nonprofit organizations that raise millions of dollars for charities across the globe. Poorly made. 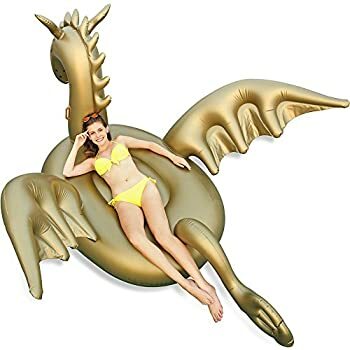 Purchased one as a kids graduation gift to float in a pool. During the FIRST USE it broke. The seam on the wing came undone and let caused it to lose air. It was not a rip, but rather a poor seam where the wing attaches to the body. Well, I understand that that can happen now an again and chalked it up to a defective item. I contacted Amazon about the issue and they were awesome, sent me a new one right away. Sadly, the new duck did the exact same thing. So, word to the wise, stay away from buying this overpriced, poorly manufactured floats, as they do not last. All in all, it cost me 50 some dollars for kids to float on duck for 20 min. 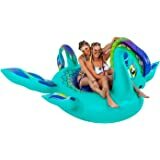 I ordered this derby duck pool float, along with 3 others (bald eagle, giant unicorn, and peacock - all made by different companies.) I would rank the derby duck as the third best of the bunch. After inflating it we used it for 4 days on a lake vacation. We used a rope to tie to the handle on the neck and kept it floating near our dock. 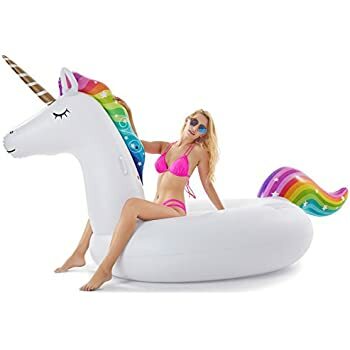 We are home now and plan to use this in a pool. PROS: Looks great in the water. Colors bright. Plastic is sturdy. The size was good / what I expected - comfortably fit one adult or two kids. Cup holders were nice. NEUTRAL: Quality/durability seem average. Better than the bald eagle, but not as heavy duty-feeling as the peacock and unicorn. That being said it is holding up fine at this point. CONS: Filling, deflating was the hardest of the bunch. Also the plug in the head portion kept popping out and deflating during our vacation. It was annoying to have to re-inflate it so you could see its head. Also, the paddle pictured is not included. 1.0 out of 5 starsFamily's favourite. Really cool. Just a little too big for medium size house pool. Still looks great and everybody loves it. One problem. We are on the second duck now. First one lasted 4 days. Wing fell off without any serious abuse on our side. The whole thing deflated and become unusable. Seller sent a new one for repleacement within 24 hours. Impressive. Duck #2 has been there now 7 days. Still alive and well. Update a month later. Duck #2 is dead. Same issue. One of the wings fell off. Reducing rating to 1/5. 1.0 out of 5 starscool but not good quality. I bought this as a birthday gift for a friend and she loved it. When we first blowed it was so cool it was big and blew up fine. But now we have to reblow it up everyday and it never stays blown up and it doesn't seem to have a hole either. Overall not happy with this purchase and would not recommend. 5.0 out of 5 starsDuck, duck, HUGE duck! Bought for use at our lake cabin. Could not believe just how big it was! Huge! I as a grown woman and my niece and I can easily fit comfortably! 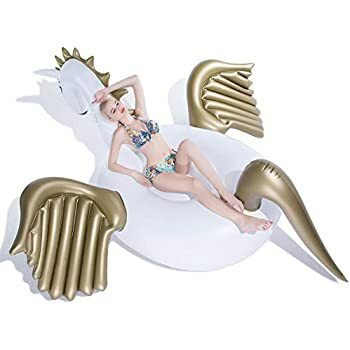 If you are looking for a super large inflatable with a whimsical shape then this duck is for you! Air valve is easy to use. 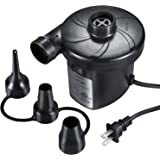 Definitely buy a battery powered air pump for this bad boy! It is too big to tackle by mouth. 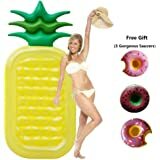 We used this at Memorial Day and all went fine. I inadvertently punctured a wing on a thorn from a nearby rose bush and it deflated overnight. Using the patch kit I thought I could seal the minute tear in the material on the wing. No such luck. The patch kit did nothing to abate the similar air loss from the prior night. I used a bIt of polyurethane sealant over the tiny, tiny hole to no avail. I'm not going to throw it away, because all I have to do is re-inflate it and it will be good for another 12 hours of play. But note: THE PATCH KIT DID NOTHING TO HELP THE DAMAGE.